Beginning April 9th, Jarren Benton from independent powerhouse label Funk Volume will be hitting the road as part of Tech N9ne’s Independent Grind Tour. The tour spans over 3 months in more than 70 different cities across the country. 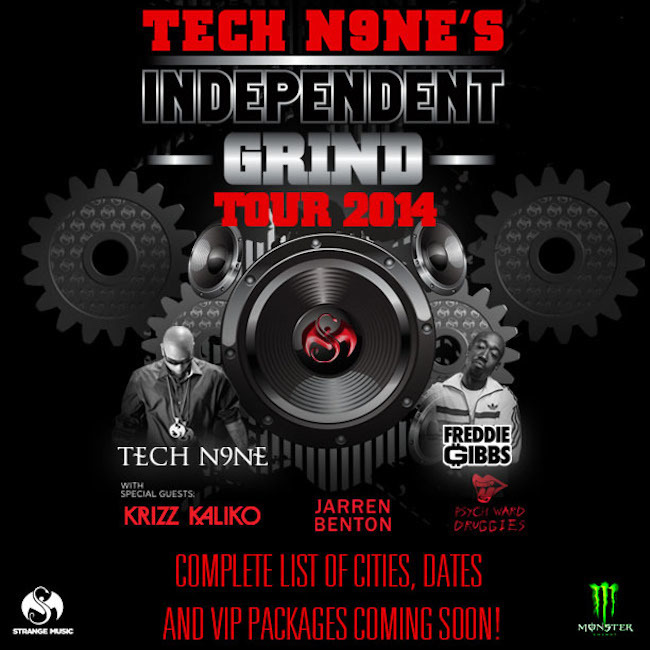 In addition to Tech N9ne, the tour will feature Freddie Gibbs, Krizz Kaliko, and the rap group Psych Ward Druggies. Tickets available here. The Independent Grind Tour comes through Benton’s hometown of Atlanta on April 19th, and then climbs up the coast and through the Midwest and to the West Coast, ending in June in Funk Volume’s home base of Los Angeles on June 4th, concluding in Kansas City on June 28th. Jarren is no newbie when it comes to rocking shows: last year he toured for almost 40 dates with Rittz on The Life And Times Tour, toured Australia with Hopsin for a week, and spearheaded his own 20-date My Grandma’s Basement Tour, his first national headlining tour. The tour followed the release of his debut album, My Grandmas Basement. An album review by HipHopDX says, “His aggressive, in-your-face style is well suited for Horrorcore fans, but he also displays true Southern roots with a handful of tracks trending towards Trap Rap.” The album, which features labelmates Hopsin and Dizzy Wright, debuted at #4 on the iTunes Hip-Hop Charts and #4 on Billboard Magazine’s Heatseekers Album chart. Jarren and the rest of his Funk Volume labelmates will be performing at SXSW 2014. Details forthcoming.